There is always a water bottle, some sort of water for Paul, magazines, books, and more books. Don't you love that lamp? I LOVE that lamp. I feel like it is more disorganized than this picture is letting on, but oh well!! 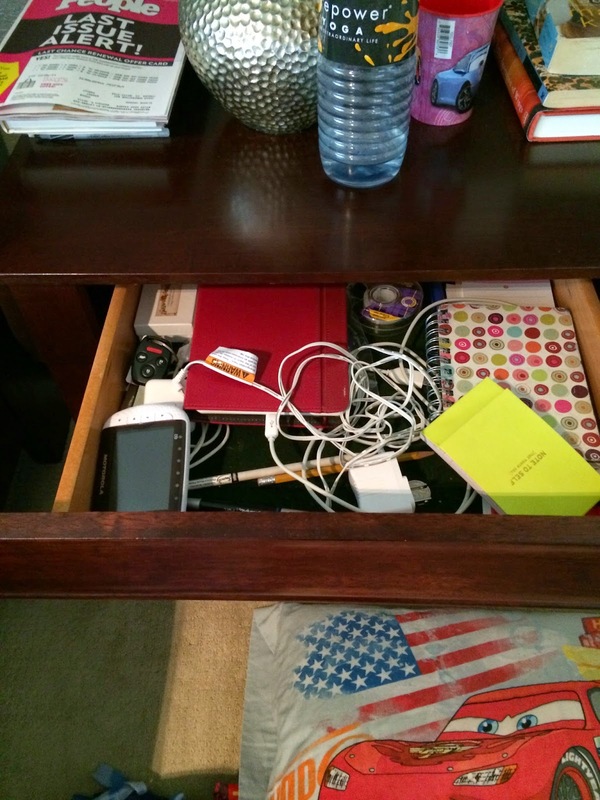 Inside the first drawer is a whole mish mash of things. Charlie's baby video monitor which we never use anymore because he's such a good sleeper and I don't have to worry about if I need to let him cry or if he's doing crazy things in crib. (I am not trying to jinx myself here universe. I REALLY appreciate what a good sleeper he is)! I have an old Kindle which I also never use because I use the Kindle app on my ipad. Oops. Also see some extra keys, some old notebooks, a lot of cords to random things and an amazing amount of pens! Oh, do you also spy a Lightning McQueen pillow? That is where Paul sleeps. Although for the past 3 nights he has started the night in his own room. HIS ROOM. But he still sleeps on the floor of his room. Why won't you sleep in your freaking bed? And he still makes his way to our room at some point in the night, but I am feeling somewhat optimistic that he is at least starting in his bedroom? Does this make me dumb? Probably. 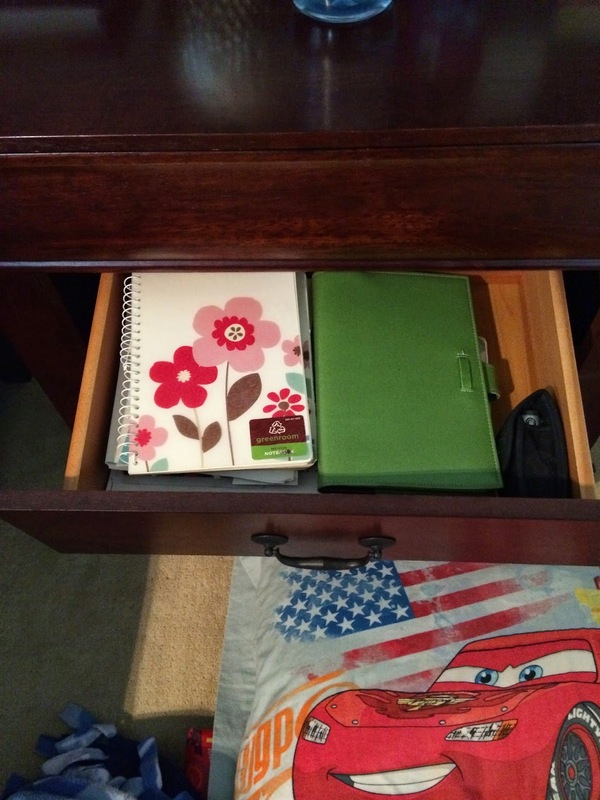 The next drawer makes me feel a bit nostalgic because it holds all my old journals. It would be nice to report that I still write, but I don't. Pretty sure I haven't written one word about anything since Charlie was born. Now I just write on here. 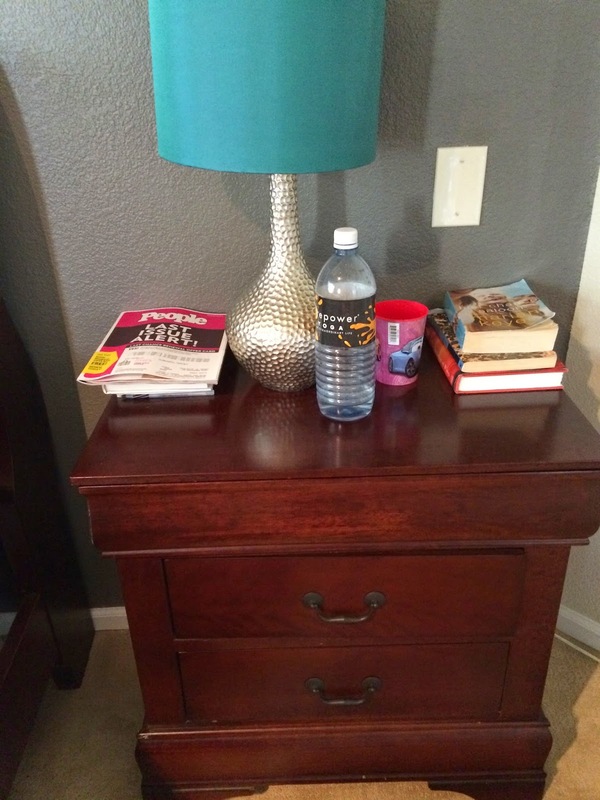 About my nightstand. Not quite the same, but I guess it is something. 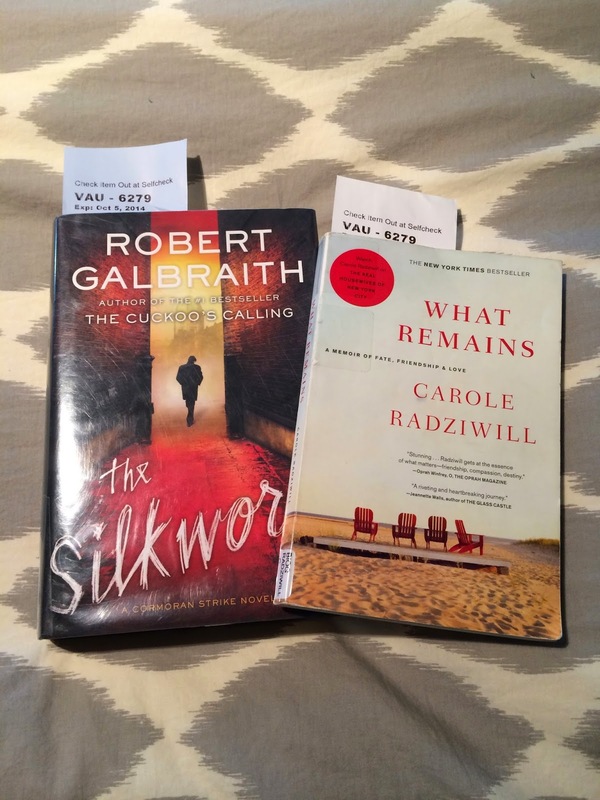 In case you are wondering the two books I currently have checkout from the library are Silkworm and What Remains. I have only started Silkworm and I really like it. Same author as the Harry Potter books but she writes under a pseudonym. My goal is to read two books, so I better get on the second one. What Remains is by one of the Real Housewives of New York City. So it is probably very high brow. So there you have it. A little peek into my nightstand. Anything interesting in yours? I love that lamp. I need that lamp. Tell me it's still available somewhere? Also, you know how long Collim has been sleeping in our bed, so you are not dumb. YES! And on sale! Pier One! I've just started reading the Silkworm book too. I assume you read the Cuckoo book first--such a talented writer!